the powerful actors that intentionally and systematically UNDER-develop communities, regions and nations in both North and South. Social Protections including healthcare, education and income security are human rights guaranteed in the Universal Declaration of Human Rights yet denied to millions, as resources are redirected towards elites. They should be at the core of the development agenda. 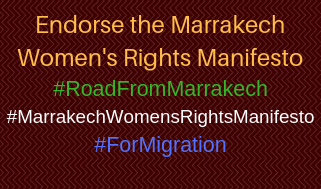 Lack of these rights is a major reason women migrate, yet when they arrive in new countries they often are unable to access these services. This interactive session will identify the policies and actors that block the delivery of economic and social human rights and examine strategies to hold state and non-state actors accountable. Grassroots reports from women and agencies working around the world, highlighting migration issues from their experience for appraisal of the achievements of the MDGs and recommendations for inclusion in the Post-2015 Development Agenda.